German Politics and Society is a joint publication of the BMW Center for German and European Studies (of the Edmund A. Walsh School of Foreign Service, Georgetown University) and all North American universities featuring programs and centers of German and European studies associated with the German Academic Exchange Service (DAAD). These centers are represented by their directors on the journal's Editorial Committee. 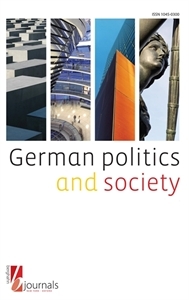 German Politics and Society is a peer-reviewed journal published and distributed by Berghahn Journals. It is the only American publication that explores issues in modern Germany from the combined perspectives of the social sciences, history, and cultural studies. The journal provides a forum for critical analysis and debate about politics, history, film, literature, visual arts, and popular culture in contemporary Germany. Every issue includes contributions by renowned scholars commenting on recent books about Germany.